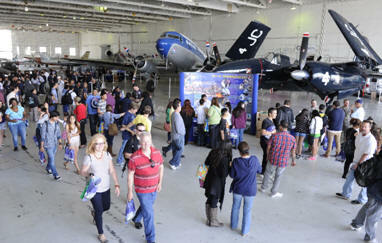 April 5, 2013 - Today, more than 1,400 high school students, over 40 exhibitors and an array of static aircraft participated in the eighth annual The Sky’s the Limit: Aviation Career Day hosted by MP Aero, Van Nuys Airport (VNY) and The Valley Economic Alliance. Congressman Tony Cárdenas spoke to the students about taking their future into their own hands by making the most of their opportunities. Students were treated to airport tours, interactive exhibits, and aircraft displays including the Cirrus VK-30, Los Angeles Fire Department Air Rescue Unit, Children’s Hospital Ambulance Service, major tenants TWC and Clay Lacy Aviation and much more. “We thank our sponsors, exhibitors, VNY and the many volunteers who made Aviation Career Day possible. It is through exposure to educational opportunities such as this that our youth gain insight into the many career options available to them," said Los Angeles World Airports Board of Airport Commission President, Michael Lawson. Van Nuys Airport (VNY) is one of three airports owned and operated by Los Angeles World Airports (LAWA), a self-supporting branch of the City of Los Angeles, governed by a seven-member Board of Airport Commissioners who are appointed by the mayor and approved by the Los Angeles City Council. One of the world's busiest general aviation airports, VNY serves as a valued San Fernando Valley resource, providing ongoing leadership in general aviation, business and community service. Dedicated to noncommercial air travel, VNY had over 260,000 operations in 2012. More than 100 businesses are located on the 730-acre airport, including four major fixed-base operators and numerous aviation service companies. Annually, the airport contributes approximately $1.3 billion to the Southern California economy and supports over 12,000 jobs. In addition, VNY provides programs to benefit local residents, along with educational initiatives and aviation-related career and training opportunities.